A new survey details how much less academic professors are making than their private practice peers. Physician compensation in academic settings continued to trail that of physicians in private practice, as is customary. Family practitioners in academic settings reported median compensation of $173,801, compared with $189,402 in private practice. Specialists in academic settings also reported median compensation that trailed physician earnings in private practice. Anesthesiologists earned $326,000 in median compensation in academic settings and $407,292 in private practice. General surgeons in academic settings earned $297,260 in median compensation, compared to $343,958 in private practice. Academic rank is one way to escape this pay gap. Primary care associate professors reported $173,963 in median compensation, but professors reported median compensation of $198,000. 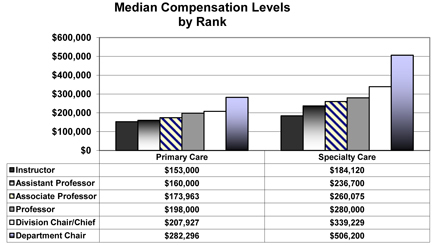 Primary care department chairs reported median compensation of $282,296. Specialty care associate professors earned $260,075 and professors earned $280,000. Specialty care department chairs reported median compensation of $506,200. The MGMA released the salary ranges in its report, Academic Practice Compensation and Production Survey for Faculty and Management: 2012 Report Based on 2011 Data. Geography also has an influence, the report said. Dermatologists in academic settings reported median compensation of $277,765 in the Midwest and $234,936 in the Western region. General pediatricians in the Eastern section reported $157,289 in median compensation and in the Southern section reported median compensation of $139,410. In the Eastern section, urologists reported $368,401 in median compensation, compared with $300,000 in the Midwest, $336,000 in the Southern section and $445,247 in the Western section. Compensation in academic settings is les influenced by clinical care reimbursement, the press release explained, and more by research support, educational activity and endowments and philanthropy.